$50 per camper and sponsor. 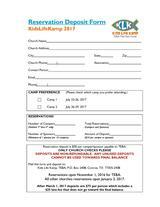 Reservations open October 1, 2018 for TEBA churches and any church that attended KLK in 2018. Reservations open December 1, 2018 for all other churches. After May 1, 2019 deposits are $75 per person.